I am back with another CPU highlight, where I’ll be taking it retro with a game that came free with every IBM computer. 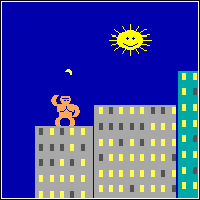 It is a very simple, fun, and challenging game where you are a gorilla – hence the name – and you are hurling an explosive banana at another gorilla. The MS DOS 5.0 was released back in 1990 so you can imagine the quality of PC game this could have been. The controls are actually very simple: when your turn begins you must put in the angle at which you want to throw the banana, followed by the velocity you’d like it to travel at. If that’s not challenging enough for you though, there’s also an option at the beginning of the game to adjust the gravity settings and increase its difficulty. Unfortunately, without a doxbox you cannot access the original game, but people have graciously recreated this game online, where you can try it absolutely free. Click this link to play it now! Let me know how you like it. Maybe it could be a game to put into the arcade – you never know! I am back with another CPU highlight! I felt like going a bit retro with this one, and I guarantee as soon as I start talking about this game you’ll all become very nostalgic with me and rejoice in this epic game. If I told you that this game allowed you to become the world’s best roller coaster maker, and a serial killer all in the same game, what would you say? [Waits for responses]… Thought you might have said that! The game I am highlighting today is Rollercoaster Tycoon. The game starts out very basic. You are in charge of making a grade A amusement park: From roller coasters, to water slides, right to merry-go-rounds and Ferris wheels. It was your job to bring joy to the computerized people who would immediately come into the park. This game also gave you objectives to complete to gain special access to certain rides, and other features. What was so realistic about this game was the weather that came with time. If it rained, you better have had umbrella stands! I have always wanted to do a spotlight in which I am able to give you, a potential game player, a chance to give opportunity to new games. When it comes to computer games it is real simple; they have to be good enough to run on your computer. Some require more RAM than others. Some require a certain video card. Logistically, I’m not that detailed when it comes to these type of spotlights, but I will give a sample of a game and give you some fun news about it. Today, I felt like giving a spotlight to; League of Legends. This online download-based game is a very fun and interactive game, where you and four other champions battle against another five champions in attempt to claim territory and take over the opponent’s base. Since this is a computer based game there are certain keys that you will use. Your basic keys are going to be Q, W, E, R, D and F. QWER represent an attack that your champion possesses based upon what type they are (Which I will explain below). Your D and F are extra abilities that you gain as you level up, which can be an extra shield, heal, etc. Essentially there are different ways to play the game, but each one has a similar objective: to destroy the enemy. There are three paths you can take; Top, Mid, Jungle and Bottom Lane. Each lane is marked by a certain type of champion and each champion has their own ability in which they will be stronger in lanes than others. Top lane champions are those who you would consider “tanks”, or those who can support themselves in battle. These champions will have a high shield level, and attack will be relatively high as well. Your Mid champions will generally be those who are mages, or those whose ability power is higher. These people will have relatively low shield levels, but high ability power. Your Bottom lane champions will consist of an Attack Damage Carry (ADC) and a Support. Your ADC will have a high attack speed and attack damage, whilst your support will be a champion who is mainly ability power. Lastly, Junglers will be the champions who are “tanky” champions but also have the ability to support top, mid and bottom lane. I began playing this game about three years ago and I quickly got addicted to it. Mostly in the manner of being able to play it with friends from around the block and my friends in another city. I began using this champion called Lux. She is a Mid lane, or Bottom Support champion. I fell in love with what she could do and her abilities. Lux has the stamina to ward off a lane and become very strong through her ability power. I chose her because of her attacks, but also due to her being a mage. Lumosity (light) is her main focus with her attacks. Just solely based upon her battle style I made my decision to use her. I know this highlight on this video game was very simple, but gave you an introduction to the game, and to a special character that has kept me playing over and over again. Do you play League of Legends? If so, what champion do you enjoy using? If you don’t play, what type of computer games do you play? Welcome to the first edition of The Vinyl Countdown, brought to you by Evanora and Zitrone. Every two weeks, we will be showcasing the best tunes from a variety of artists and genres. We hope you enjoy our reviews and don’t forget to listen and leave your own small reviews in the comment section below!